Why the KEF Q350 is a 2017 What Hi-Fi? Award Product of the Year winner | What Hi-Fi? KEF’s Q Series has made a triumphant return in 2017. The KEF Q350 refines and upgrades everything we knew and loved about previous generations of KEF bookshelf speakers, delivering a level of performance that rivals simply can’t match. That’s why the Q350s win 2017’s What Hi-Fi? Award for best standmount speaker £400-£800 and is our standmount product of the year. Available in equally smart black and white finishes, the Q350s have a sleek and sturdy design, with centre-stage given to the iconic Uni-Q driver. The driver design comprises a 25mm vented aluminium dome tweeter sitting within a 16.5cm aluminium mid/bass driver. This single point-source arrangement is designed to improve integration and dispersion, while the distinctive tangerine waveguide on the tweeter helps distribute sound evenly. Learnings from KEF’s high-end Reference series have been applied to this £530 speaker, with various design tweaks helping to reduce distortion. The central position of the driver within the cabinet aims to help reduce internal standing waves and improve clarity, while a CFD-designed rear port promises to reduce noise for better-sounding bass. And KEF’s redesigns pay off – the Q350s display an all-round level of performance that’s unheard of at this price. Whether you’re listening to rock or pop, classical or electronic music, the speakers deliver class-leading levels of subtlety, clarity and dynamics. The good-sized cabinet helps the Q350s deliver impressive bass weight, while higher frequencies are kept crisp and clear. Thanks to the Uni-Q driver technology, the speakers deliver an integrated, cohesive sound, that sounds entertaining and even-handed, no matter how challenging the track. Treble notes never sound thin or harsh, while powerful bass lines are kept tightly under control. The KEF Q350s show no signs of distortion, nor do they lose composure when dealt more complicated tracks. Simply put, they sound every bit as solid and composed as they look. From the smart, minimalist design to the insightful, informative sound, the KEF Q350 speakers are the complete package – and the best pair of bookshelf speakers on the market for the money. That’s why they’re a 2017 What Hi-Fi? Award-winner. 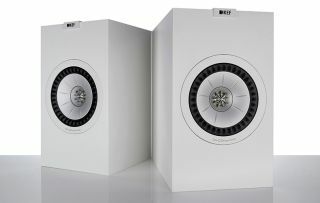 To find out more about the KEF Q350s, click here.